Properly installed wall flashing is critical to your building’s health. Many builders and designers believe that inadequate vapor barriers are the main cause of moisture problems and wood decay in walls. However, the vast majority of water problems in walls are caused by water leakage from the exterior — not by poor vapor barriers. These leaks are primarily around windows and doors, but also occur at other penetrations and joints in the siding and trim. The long-term solution is proper flashing. Caulking can help in some cases, but never lasts for long and in some cases can do more harm than good. See Window Flashing for details. CLICK TO ENLARGE Protect corner boards with durable felt splines that extend 6 in. beyond the corner boards. With this type of backup protection, and the siding end-grain well sealed, it is not necessary to caulk the siding joints. 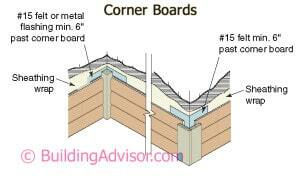 Building corners are prone to water leakage due to wind exposure and shrinkage of the corner boards. A simple approach that works well is to add a spline of asphalt felt paper at outside corners that extends 6 in. beyond the corner boards. The asphalt felt paper should go over the sheathing wrap, which should also wrap the corners at least 6 in. each way. Inside corners also benefit from a spline (see Illustration). 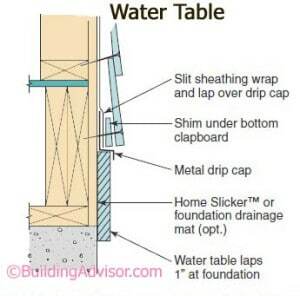 CLICK TO ENLARGE Many traditional homes have a wide board, called a water table, along the top of the foundation. The water table should extend about an inch over the foundation, and be protected by a metal drip cap tucked under the housewrap or building paper. Many traditional homes have a wide board called the “water table” that runs around the house along the foundation and supports the first piece of siding. The water table should overlap the foundation by about 1 in. and be capped on top with either a preformed metal drip cap or a custom flashing installed under the sheathing wrap. Cut a slit in the sheathing wrap along the entire length of the water table and slip the upper leg of the flashing under the wrap (see Illustration). Metal termite shields are still widely used as a physical barrier to termite entry at the top of foundation walls in the southern US and in tropical climates. The metal barriers sit directly on top of foundation walls, piers, and other supports before the first piece of wood is installed (see Illustration). CLICK TO ENLARGE Termite shields are widely used in southern states. They do not stop termites, but can slow down their progress and force them to build their tunnels where they can be easily seen during inspections. Subterranean termites. Termite shields were originally developed to block the entry of subterranean termites, the most widespread and harmful wood-destroying insect in the United States. The termites nest in the soil outside the home and enter the building to feast on the wooden portions of the house. Unfortunately, the tenacious creatures will find and penetrate the tiniest gaps in termite shields to reach the wooden portions of a house. Inspect for tunnels. Since subterranean termites cannot tolerate open air for long, they build mud tunnels from the soil to the house, along exposed foundation walls and around termite shields if necessary. Although the shields rarely stop termites, they impede their progress and force them to build tunnels that are easily seen during inspections. Seal all joints and penetrations. To be effective, termite shields must have tightly sealed joints and be sealed around foundation bolts and other penetrations. Joints should be either soldered or me­chanically interlocked. If the metal barrier is not tightly sealed at joints and penetrations, termites will easily bypass the shield. 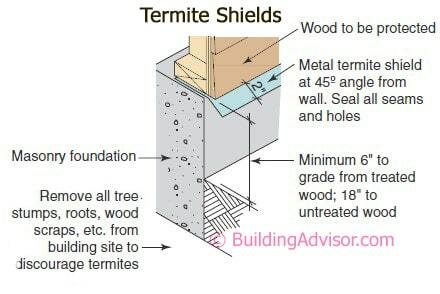 Termite shield details. Termite shields should be at least 6 in. above grade and extend out 2 in. on either side of the foundation downward at 45 degrees. In addition to mak­ing infestations visible, termite shields also form a capillary break between the foundation and sill, protecting the sill from moisture. Trouble spots. Areas that are hidden from inspection and where ter­mite shields cannot be used are at high risk of infestation. For example the crevice between concrete stairs and the foundation is a common entry point. The same problem occurs where a raised porch or patio slab attaches to the main building. Another common entry point is where stucco or exterior foam insulation extends below grade, providing a perfect hidden entry route for termites. Chemical treatment. In termite-prone regions, the only reliable way to pre­vent termite damage is to use treated wood in critical loca­tions and treat the surrounding soil with termiticide. Modern baiting systems are more costly than traditional treatment, but use smaller quantities of less toxic materials, making them appealing to many homeowners. Most backyard decks are supported along the house by a “ledger,” a length of framing bolted or nailed (not a good idea) to the house. It is critical to protect this area from water problems, since decay in the ledger or the framing it attaches to can cause a deck to collapse. Membrane flashing was retrofitted here to protect the ledger and wall framing from water intrusion. For water protection here, at a minimum install a cap flashing that tucks under the sheathing wrap and goes over the ledger. Adding a second flashing, either peel-and-stick membrane or metal flashing, between the sheathing and ledger, as shown, is a worthwhile backup should any water get over, around, or through punctures in the cap flashing. Since pressure-treated wood is corrosive to aluminum, it’s best to use membranes, plastics, or corrosion-resistant metals such as copper or lead-coated copper in direct contact with pressure treated wood. Read more on Flashing Deck Ledgers. All flashings must integrate with adjacent materials, so water always flows to the exterior, following the shingle principle. 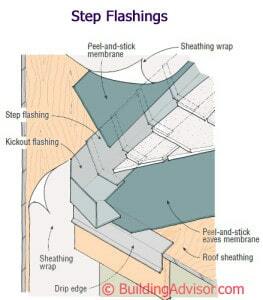 Where a slope roof meets a sidewall, slip the upper legs of the step flashing under the sheathing wrap (see Illustration). CLICK TO ENLARGE Make sure the sheathing wrap overlaps all step flashings. Where snow buildup is likely, add a wide band of peel-and-stick membrane lapped over the step flashing, but under the sheathing wrap. In areas where snow may build up, add a wide band of peel-and-stick membrane over the step flashing but under the sheathing wrap, as shown. Where the step flashing terminates along a sidewall is a common trouble spot for moisture problems. The best solution is a preformed or custom-bent kick-out flashing to divert the water away from the siding. Otherwise, dripping water will leave its mark along the siding. In all cases, make sure to detail the flashing membrane so that it sheds water. It should tuck under the sheathing wrap above and over the flashing below. 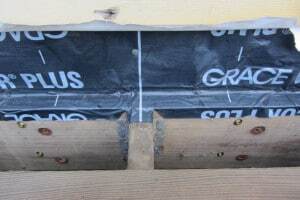 If installed along the foundation, the membrane should cover the joint where the sill meets the foundation. Do not apply more membrane than is needed to protect the wall – up to 3-feet wide in climates with substantial rain or snow. Applying too much will create a cold-side vapor barrier, which can lead to serious moisture problems in cold climates. Our friends have a new home (only 4 years old) where they have had various water seepage and leakage problems. Some spots are obvious (cracks in foundation); but they also have had water coming in through the walls, and they were told that there were some issues with their siding or possibly the Tyvek installed incorrectly. They were already told by one local inspection company that there were issues with other subdivisions built by this particular builder. Currently they are not even living in this home as the reactions of one member (who has Lyme disease) is bad. But other family members are experiencing negative reactions also. So…is there likely to be one contractor who can look at EVERY possible hidden water entryway? Sorry to hear about your friends’ water leakage problems. The most common areas for water leakage are basements, roofs (typically around chimneys, skylights, and other penetrations), and wall penetrations such as windows and doors. In most cases, roof and wall leaks are related to improper flashing. Diagnosing and solving leakage problems can be challenging and expensive. Sometimes the place where water appears in your home is a distance from where it is leaking in. It may run along a framing member or building cavity before appearing on the interior. Sometimes a condensation problem or plumbing leak is mistaken for a leak in the building shell. Once the source of a leak is identified, it can be expensive to fix. If one window is flashed poorly, it’s possible that all are. However, some may not leak despite faulty installation because they are protected by a roof overhang, and some may leak more than others due to exposure to wind-driven rain or water dripping from above. In some cases the source of a leak is pretty obvious, but other times it can take a good deal of detective work to identify the cause and how to correct it. Often a section of siding or roofing, or interior finishes, need to be removed to confirm the source of the leak. Additional materials may need to be removed to correct the problem. For example, if the windows are flashed incorrectly, then siding must be removed around each window to re-flash them correctly and properly integrate the flashing with the sheathing wrap such as Tyvek. Caulking around the top and sides of window can often provide a temporary fix, but over time the caulking will fail. Read more on Window Flashing. Basement water problems can be particularly vexing as multiple factors may be contributing to the problem in addition to the cracks, such as surface drainage around the foundation, water table, footing drains, and soil characteristics. Sometimes the fix is relatively easy and inexpensive, but often it is very costly to do the job right – the way it should have been done when the house was built. To avoid the expense of excavation and regrading around an existing home, sometimes a sump pump that runs frequently and/or retrofitting an interior basement drainage systems is the most practical approach. Read more Basement Leakage FAQs. Can one person identify and fix all these problems? Possibly, but you might be better off using a foundation expert for the basement problems and a flashing expert for the sidewall leaks. I would recommend talking to two or three contractors about each problem to see if you are getting consistent answers and to compare bids. Make sure you get a written guarantee that the remedial work will solve the problem and make sure it is solved before making the final payment. Your friends might also consider hiring a water-leakage consultant to analyze the problem and specify the solution and then hire one or more contractors to do the work. This may be the most expensive approach, but given the scope and complexity of the problem, it may be worthwhile to have a third party acting on your behalf.